The Australian Government has launched “Clean Energy Future”, an integrated advertising campaign design to provide the Australian community with information about the Government’s plan for a clean energy future. The campaign, online at cleanenergyfuture.gov.au, climatechange.gov.au, Facebook, Twitter (@cefgovau) and Youtube, provides information on what the Government’s plan means for households, businesses and communities. Television commercials feature real Australians who work in large and small organisations involved in creating a clean energy future for Australia. The campaign also includes print and radio advertisements, along with brochures. The following three commercials are currently set as “private”. Dr Doone Wyborn is Chief Scientist at Geodynamics. Chris McGrath is Development Manager, Infigen, a company responsible for building wind farms. Alex Wonhas is director of the Energy Transformed Flagship in CSIRO, the government’s scientific research community. 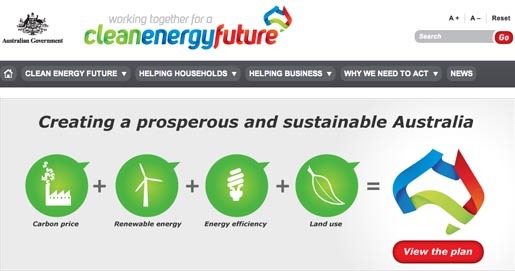 The Clean Energy Future campaign was developed at Smart, Melbourne. The site was developed at Osky Interactive, Canberra. Filming was shot by director Ben Lawrence via The Feds. Music was produced at Electric Dreams.